A river of meltwater flowing across Greenland’s ice sheet. 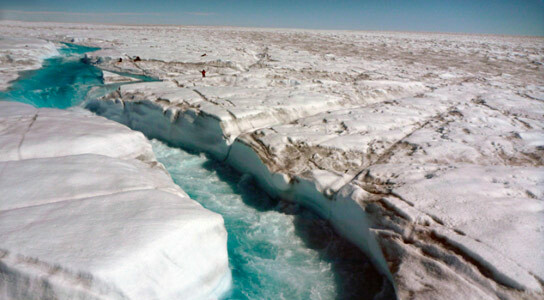 Using satellite and field work after an extreme melt event in Greenland, new research shows that melt-prone areas on the ice sheet develop a remarkably efficient drainage system of streams and rivers that carry meltwater into moulins (sinkholes) and ultimately the ocean. Until now, however, scientists’ attention has mostly focused on the ice sheet’s aquamarine lakes — bodies of meltwater that tend to abruptly drain — and on monster chunks of ice that slide into the ocean to become icebergs. “It’s the world’s biggest water park, with magnificent and beautiful — but deadly — rushing blue rivers cutting canyons into the ice,” said Laurence C. Smith, the study’s lead author and the chair of UCLA’s geography department. With funding from NASA’s Cryospheric Sciences program, 11 researchers — three of them UCLA graduate students — spent six days during July 2012, gathering measurements in an environment so hostile and dangerous that no such effort had ever been attempted. Because the ice sheet was so unsteady and the amount of territory they covered was so great, researchers moved around by helicopter. To map the network and compute the rivers’ flow rates, they used military-grade satellite imagery, buoys outfitted with GPS technology and a drone boat specially designed for the project by a Jet Propulsion Laboratory engineer who also worked on the Mars Rover. The study happened to coincide with a massive and extremely unusual melt. On only one other occasion in the past 700 years — in 1889 — has the ice sheet thawed as much as it did in 2012. “It was a real preview of just how quickly that ice sheet can melt and the meltwater can escape,” Smith said. “The question was whether the ice sheet acts like a sponge or like Swiss cheese,” Smith said. Meanwhile, a modest “sponge” effect occurred somewhere below the surface — either inside or, more likely, at the base of the ice sheet. Within this area, the researchers determined, the ice sheet drained at a rate of 55,000 to 61,000 cubic feet per second, a rate more than double the average flow of the Colorado River, produced from less than one-tenth of its watershed area. The group also specifically examined the Isortoq River, which exits the ice sheet on land and drains about one-fifth of the mapped networks. Its output is critical because it’s a key element of the Modele Atmospherique Regional, or MAR, a climate model used by the Intergovernmental Panel on Climate Change to develop worldwide responses to global warming. The researchers found that the Isortoq’s amount of discharge was more than 25 percent less than the model predicted. “There’s a lot of water coming out of the ice sheet but a certain amount can’t be accounted for,” said study co-author Vena Chu, a UCLA doctoral candidate in geography. Still, researchers found that the flow in the Isortoq River carried meltwater from the ice sheet to the ocean at an average flow rate of 23,000 to 46,000 feet per second — a massive flow rate that is all the more awe-inspiring because the Isortoq is but one of at least 100 large terrestrial rivers connecting the melting Greenland ice sheet to the world’s oceans. 1 Comment on "Rivers of Glacial Meltwater Contribute to Rising Sea Levels"
“Contribute to Rising Sea Levels” At what rate are the seas rising? How much have they risen since 2000?